Network World has assembled a comprehensive reference collection of technical resources to help guide your decision making. We live in the age of digital transformation – data is on-prem, virtualized and in multiple clouds. 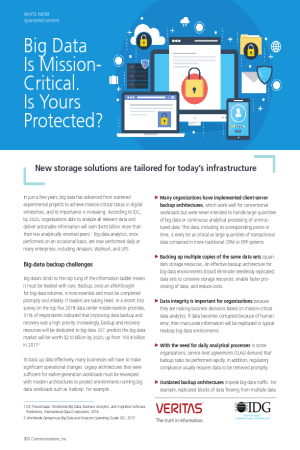 As organizations adopt containers, hyperconverged infrastructure and more cloud workloads, it’s critical to have a proper data protection solution that provides end-to-end visibility and automates the protection of all your data, regardless of where it resides. Rapid digital transformation is replacing legacy architectures with modern architectures such as hyperconverged infrastructure. According to Stratistics MRC, the Global Hyperconverged Infrastructure market will reach approximately $17027M by 2023, and grow at a CAGR of 42.0% from 2016 to 2023. Do you need scale-out modern architecture that can easily be deployed, managed, and protected in a highly virtualized environment? Join us for this 30 minute webinar and learn how Veritas NetBackup 8.1 Parallel Streaming Framework has been certified and tested to protect workloads virtualized on AHV, Nutanix’s native hypervisor, providing an on-demand, agentless scale-out architecture that grows with your business. 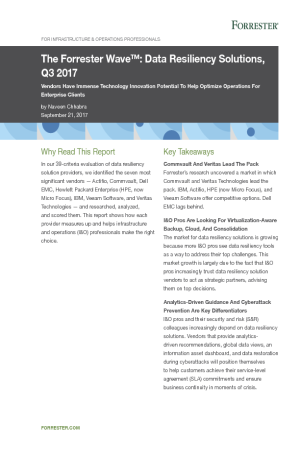 Vendors Have Immense Technology Innovation Potential To Help Optimize Operations For Enterprise Clients This report shows how each provider measures up and helps infrastructure and operations (I&O) professionals make the right choice. Big Data Is Mission-Critical. Is Yours Protected? In just a few years, big data has advanced from scattered experimental projects to achieve mission-critical status in digital enterprises, and its importance is increasing. According to IDC, by 2020, organizations able to analyze all relevant data and deliver actionable information will earn $430 billion more than their less analytically oriented peers. The digital business continues to evolve. Investments in data analytics projects lead the way while traditional, proprietary infrastructures are being disrupted by cloud, open source and hyperconverged paradigms. These changes are forcing IT leaders to contend with greater workload diversity in the midst of tightening budgets. And while the workload [or] IT landscape is changing, the need for reliable data protection remains as crucial as ever to protect against, data corruption, human error, and malicious threats such as ransomware. Learn how Veritas can help you navigate through these obstacles. Join us to hear experts from ESG and Veritas discuss how the right data protection solution today can prepare you for tomorrow's business demands. Big Data has become mission critical to your business. In fact, According to IDC*, Big Data will soon become a $210B market. So how are you protecting data today? Do you need a more modern approach? Join this webinar and learn about NetBackup with Parallel Streaming Framework specifically designed for scale-out, on-demand, multi-node workloads. All on an agentless architecture. You will learn how NetBackup can help you cut storage space by two-thirds, save on storage costs, and achieve 3X the backup performance. 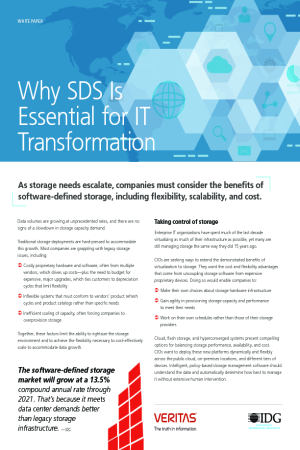 This white paper, “Why SDS is Essential for IT Transformation,” helps you identify what to look for and what’s possible with SDS.